How to improve the quality of audio tracks when ripping a scratched audio CD under iTunes? You can enable the error correction feature of iTunes, to try to get a better result. Click on the "Import Settings" button. Check "Use error correction when reading Audio CDs"
Published by deri58. Latest update on July 5, 2013 at 08:20 AM by deri58. 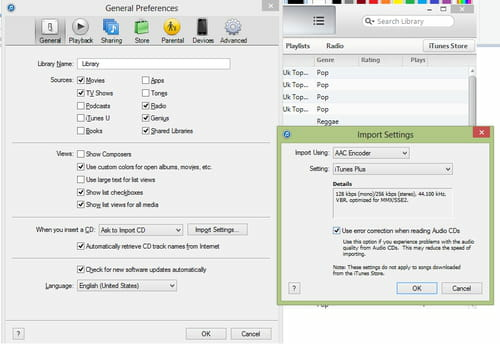 This document, titled "iTunes - Enable error correction when importing audio CDs," is available under the Creative Commons license. Any copy, reuse, or modification of the content should be sufficiently credited to CCM (https://ccm.net/).